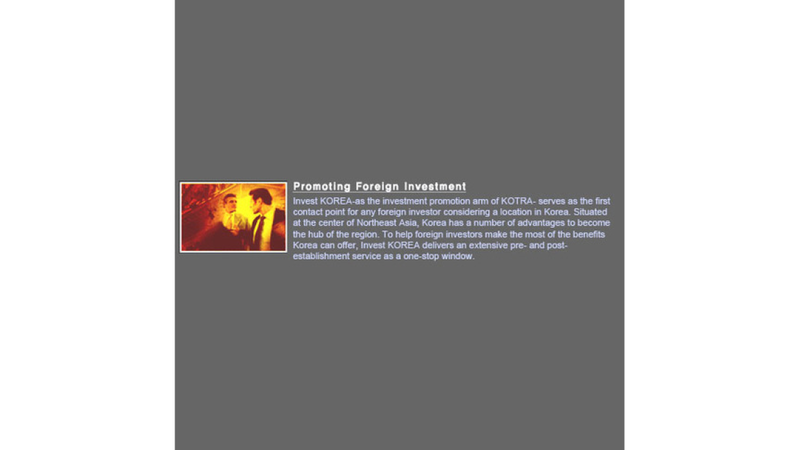 Invest KOREA is the Korean national investment promotion agency established with the sole purpose of facilitating the entry and successful establishment of foreign business into Korea. To provide a comprehensive service to meet the foreign investors&apos; every need as a one-stop window, Invest KOREA is staffed with experts from various ministries and relevant organizations. A major component of Invest KOREA is the Office of the Investment Ombudsman, a troubleshooting service to help foreign companies resolve any difficulties they may have in doing business in Korea. For the successful establishment of foreign business in Korea, the OIO&apos;s "Home Doctors" provide one-on-one service in such areas as construction, finance, tax, labor, law and matters of daily living including housing, visas and children&apos;s education. Invest KOREA operates a network of overseas branch offices in 35 leading Korea Trade Centers. With each branch located in a major world business center, Invest KOREA can justifiably claim to be on the doorstep of investors everywhere.